SEATTLE (July 19, 2013) – Seattle-area Animal Communicator (Pet Psychic) Joan Ranquet is credited with saving a Fjord pony that had fallen into a 70-foot ravine and was missing for more than a day. The rescue search involved eight agencies, 65 people and a pet psychic. 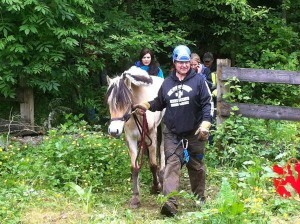 Fortunately, Gemma, the 4-year-old Fjord pony, walked out unharmed. “Without the horse communicator, I don’t know that we would have ever found the horse,” said Barbara Linstedt, who owns Saddle Rock Stables and the neighboring pasture where the pony went missing from. After hopelessly searching for Gemma for hours, Barbara contacted Joan Ranquet, who was able to help locate the 800-pound horse after only seeing a picture of Gemma. After hearing that, Linstedt immediately thought of one place they hadn’t searched yet, which was over the ledge where Gemma had gotten herself trapped. Rescue workers with the Washington State Animal Response Team secured a harness around Gemma and pulled her the 70 feet up to safety. Ranquet is happy to report that Gemma is doing great since returning home, and is back to training and enjoying her life! Joan Ranquet is an Animal Communicator and author of Communication with all Life, Revelations of an Animal Communicator (Hay House). Through private sessions, workshops, teleseminars and speaking events, Joan facilitates a deepening of the human/animal connection. Joan was chosen by MSN as one of the “Top 25 People Who Do What They Love.” Her newest book, “Energy Healing for Animals, Techniques to Enhance the Health, Longevity & Happiness of the Animals We Love” will be also be out 2013 (Sounds True). “Animal Communication 101, Simple Steps to Communicate with Animals” came out January 2012. Joan is a regular contributor to Horse Connection Magazine and Creature Companion, India’s foremost pet magazine. Joan Ranquet is also Founder of Communication with all Life University (CWALU). CWALU offers programs for both the pet lover to the serious student of Animal Communication and everyone in between! CWALU helps the average pet owner be able to “read their pet” better. CWALU opens the door for the person looking to work with animals. CWALU offers full time, part time and online studies. For the full time student, it is a comprehensive Animal Communication Certification program. For the average pet owner it can be a fun filled weekend workshop or a teleseminar. Weekend workshops are taught quarterly in Washington state and every other month around the country. Teleseminars and webinars are also available. For more information, visit Joan online at www.joanranquet.com or connect with her on Facebook at https://www.facebook.com/joanranquet.